Bahrain, officially the Kingdom of Bahrain (Arabic: مملكة البحرين Mamlakat al-Baḥrayn), is an island country in the Persian Gulf and is the smallest Arab nation. Bahrain was the first location in the region in which oil reserves were discovered. As a result it has become a wealthy nation. With a per capita GDP of $25,300 in 2006, Bahrain was ranked 35th on a list of 181 nations. This wealth has been invested in free education and free health care, resulting in relatively high literacy and life expectancy. 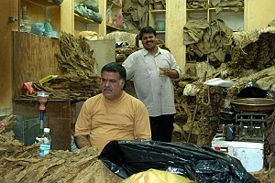 Bahrain has a unique, indigenous middle class, which contributes to the tendency of that nation being more liberal than its neighbors. Though the official religion is Islam, Bahrainis are known for their religious tolerance. Bahrain, from the Arabic word for "two seas," is a generally flat, arid archipelago, comprised of a low desert plain rising gently to a low central escarpment, located east of Saudi Arabia, and north of Qatar. The "two seas" name is thought to refer either to the fact that the islands contain two sources of water, sweet water springs and salty water in the surrounding seas, or to the south and north waters of the Persian Gulf, separating it from the Arabian coast and Iran, respectively. A much older, non-Semitic term, Bahran; according to some scholars, originates from Varahrdn, the later form of the old Avestan Verethragna—a Zoroastrian divinity that represents victory. 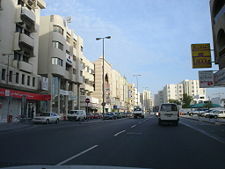 Considered to be one of the 15 Middle East states that comprise the "Cradle of Humanity," Bahrain has a total area of 266 square miles (688 square kilometers), which is about four times the size of the District of Columbia in the United States, although smaller than the nearby King Fahd Airport in Dammam, Saudi Arabia. The largest island, accounting for 83 percent of the area, is called Bahrain (also known as Al Bahrayn), which is 29 miles (48km) long, and 10 miles (16km) from east to west at its widest point. 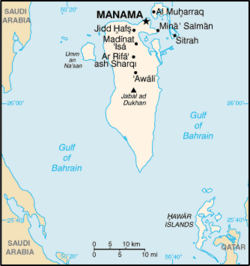 As an archipelago of 33 islands, Bahrain does not share a land boundary with another country but does have a 100-mile (161-kilometer) coastline and claims a further 12 nautical miles (22km) of territorial sea and a 24 nautical mile (44km) contiguous zone. Around most of Bahrain is a relatively shallow inlet known as the Gulf of Bahrain. 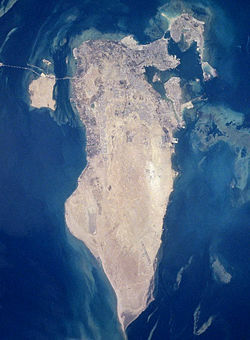 The seabed adjacent to Bahrain is rocky and, mainly off the northern part of the island, covered by extensive coral reefs. Most of the island is low-lying and barren desert. Outcroppings of limestone form low rolling hills, stubby cliffs, and shallow ravines. The limestone is covered by saline sand, capable of supporting only the hardiest desert vegetation—chiefly thorn trees and scrub. There is a fertile strip three miles (5km) wide along the northern coast on which date, almond, fig, and pomegranate trees grow. The interior contains an escarpment that rises to 400-foot (122-meter) Jabal ad Dukhan (Mountain of Smoke), the highest point named for the mists that often wreathe the summit. 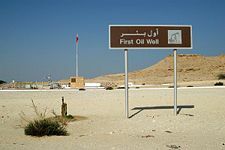 Most of the country's oil wells are situated in the vicinity of Jabal ad Dukhan. Bahrain has two seasons—an extremely hot, humid, summer and a relatively mild winter. During the summer, from April to October, afternoon temperatures average 104°F (40°C). A hot, dry south-west wind blows sand clouds. Temperatures moderate in the winter, from November to March, when the range is between 50°F (10°C) and 68°F (20°C). However, humidity often rises above 90 percent in the winter. Bahrain receives little precipitation. The average annual rainfall is 2.8 inches (72mm), usually confined to winter. No permanent rivers or streams exist on any of the islands. The winter rains tend to fall in brief, torrential bursts, flooding the shallow wadis that are dry the rest of the year. Little of the rainwater is saved for irrigation or drinking. However, there are numerous natural springs in the northern part of Bahrain and on adjacent islands. Underground freshwater deposits extend beneath the Gulf of Bahrain to the Saudi Arabian coast. Since the early 1980s, desalination plants, which render seawater suitable for domestic and industrial use, have provided about 60 percent of daily water consumption needs. Bahrain's natural resources include large quantities of oil and associated and non-associated natural gas as well as fish stocks, which is perhaps fortunate as arable land constitutes only 2.82 percent. Desert constitutes 92 percent of Bahrain and periodic droughts and dust storms are the main natural hazards for Bahrainis. Environmental issues facing Bahrain include desertification resulting from the degradation of limited arable land and coastal degradation (damage to coastlines, coral reefs, and sea vegetation) resulting from oil spills and other discharges from large tankers, oil refineries, and distribution stations. The agricultural and domestic sectors' over-utilization of the Dammam aquifer, the principle aquifer in Bahrain, has led to its salinization by adjacent brackish and saline water bodies. 'Manama' (Arabic: المنامة Al-Manāmah) is the capital city and is the country's largest city with a population of approximately 155,000, roughly a quarter of the country's entire population. The main port, Mina Salman, is located on the island, as are the major petroleum refining facilities and commercial centers. Causeways and bridges connect Bahrain to adjacent islands and the mainland of Saudi Arabia. 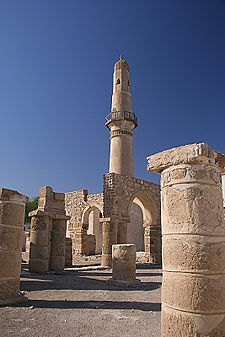 Khamis Mosque, believed to have been built in the seventh century C.E. A strategic position between East and West, fertile lands, fresh water, and pearl diving made Bahrain long a center of urban settlement. About 2300 B.C.E., Bahrain became a center of one of the ancient empires trading between Mesopotamia (now Iraq) and the Indus Valley (now in Pakistan and India). This was the civilization of Dilmun (sometimes transliterated Telmun) that was linked to the Sumerian Civilization in the third millennium B.C.E. Dilmun developed into one of the greatest entrepôts of trade of the ancient world. Bahrain became part of the Babylonian Empire about 600 B.C.E. Bahrain was also called the "Pearl of the Persian Gulf." Bahrain was referred to by the Greeks as "Tylos," the centre of pearl trading, when Nearchus (c. 360 - 300 B.C.E.) visited it while serving under Alexander the Great. The town of Muharraq was referred to as "Arados." The Middle-Persian/Pahlavi name for the island was Mishmahig, meaning "ewe-fish." Mishmahig or Mashmahig is attested to in the Babylonian Talmud as a port where pearls were found (c. 250 B.C.E. and 550 C.E.). In Nestorian sources, Mashmahig is mentioned for the first time in the year 410 C.E., when Batai, Bishop of Mashmahig, was excommunicated by Mar Isaac, and Elias was put in his place. These sources, said Mashmahig was a centre of heresy and revolt. Until Bahrain embraced Islam in 629 C.E., it was a centre for Nestorian Christianity. In 899, a millenarian Ismaili sect, the Qarmatians, seized the country and sought to create a utopian society and distribute all property evenly among the initiates. The Qarmatians caused disruption throughout the Islamic world. They collected tribute from the caliph in Baghdad, and in 930 sacked Mecca and Medina, bringing the sacred Black Stone back to Bahrain where it was held to ransom. They were defeated in 976 by the Abbasids. Up until 1521, the name "Bahrain" referred to the larger region including Ahsa, Qatif (both became the eastern province of Saudi Arabia) as well as Awal (now Bahrain Islands). The region stretched from Basrah to the Strait of Hormuz in Oman. This was Iqlīm al-Bahrayn "Bahrayn Province" and the Arab inhabitants of the province, descendants of the Arab tribe Banī 'Abdu l-Qays, were called Bahārna after it. In 1521, a Portuguese force invaded Bahrain to take control of the wealth created by its pearl industry. 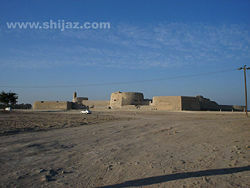 The defeated King Muqrin was beheaded after Correia defeated his forces near present day Karbabad and took control of the fort "Qala'at Al-Bahrain." The Portuguese ruled through brutal force for 80 years, until they were driven out in 1602, when an uprising was sparked when the governor ordered the execution of the island's richest traders. The uprising coincided with regional disputes between the Portuguese and rival European powers. From the sixteenth century to 1743, control of Bahrain drifted between the Portuguese and the Persians. Ultimately, the Persian Afsharid king, Nadir Shah, invaded and took control of Bahrain, and for reasons of political control supported the Shī'a majority. In the late eighteenth century, the al-Khalifa family invaded and captured the islands from their base in neighboring Qatar. In order to secure Bahrain from returning to Persian control, the Emirate entered into a treaty with the United Kingdom and became a British protectorate. Oil was discovered in Bahrain in 1932, the first place in the region to find oil. This brought rapid modernization to Bahrain, and strengthened the relationship with the United Kingdom. British influence continued to grow, culminating with the appointment of advisor Charles Belgrave, who established a modern education system there. After World War II, increasing anti-British sentiment through the Arab world led to riots in Bahrain. In 1960, the United Kingdom put Bahrain's future to international arbitration and requested that the United Nations Secretary-General take on this responsibility. In 1970, Iran simultaneously laid claim to both Bahrain and the other Persian Gulf islands. However, it agreed with the United Kingdom to "not pursue" its claims on Bahrain if its other claims were realized. A plebiscite saw Bahrainis confirm their independence from Britain and their Arab identity. Bahrain remained a member of the Arab League and Gulf Cooperation Council. The British withdrew from Bahrain on August 15, 1971, making Bahrain an independent emirate. The oil boom of the 1980s greatly benefited Bahrain, as did the Lebanese civil war, which began in the 1970s, and which meant that Bahrain replaced Beirut as the Middle East's financial hub. After the 1979 Islamic revolution in Iran, Bahraini Shī'a fundamentalists in 1981 orchestrated a failed coup attempt under the auspices of the Islamic Front for the Liberation of Bahrain. The coup would have installed a Shī'a cleric exiled in Iran, as supreme leader heading a theocratic government. In 1994 a wave of rioting by disaffected Shīa Islamists was sparked by women's participation in a sporting event. Sporadic violence between the government and Islamists during the mid-1990s left over 40 people dead. Torture was a political tool in Bahrain between 1974 and 1999, when the State Security Act 1974 was in force, but prior to the accession of King Hamad. The State Security Act, formally reversed in 2001, contained measures permitting the government to arrest and imprison individuals without trial for a period of up to three years for crimes relating to state security. Torture appears to have been most prevalent during the 1990s uprising, between 1994 and 1997 when civilians sought the return of the liberal Constitution of 1973 and their Parliament by presenting two public petitions to the Emir. Individuals who were connected to this petition were deemed to be acting against the regime and were subsequently detained under the State Security Laws, subjected to torture and a number were forced into exile. 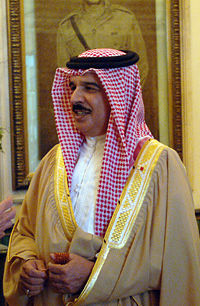 In March 1999, Hamad ibn Isa al-Khalifah succeeded his father as head of state and instituted elections for parliament, gave women the right to vote and released all political prisoners; moves described by Amnesty International as representing an “historic period for human rights.” The country was declared a kingdom in 2002. Bahrain is a constitutional monarchy headed by the King, Shaikh Hamad bin Isa Al Khalifa. The head of government is the Prime Minister, Shaykh Khalīfa bin Salman al Khalifa, who is appointed by the monarch, and who presides over a cabinet of 23 members, who are also appointed by the monarch. Bahrain has a bicameral legislature with a lower house, the Chamber of Deputies, elected by universal suffrage for four years, and the upper house, the Shura Council, appointed by the King. Both houses have 40 members. The bicameral legislature was created in December, 2000, and the first legislative term was from December 2002. All aged 20 years and over may vote. Political parties prohibited but political societies were legalized in 2005. Al Wefaq National Islamic Society (جمعية الوفاق الوطني الإسلامية Jam'iyat al-Wifaq al-Watany al-Islamiyah), Bahrain's largest and most popular political society, has a Shia Islamist political orientation, and is led by a cleric, Sheikh Ali Salman. With 1500 active members, and the backing of the Islamic Scholars Council and Grand Ayatollah Ali Al Sistani, it won all but one of the 18 seats it contested. The King created a Supreme Judicial Council to regulate the country's courts and separate the administrative and judicial branches of government. The legal system is based on Islamic law (Sharia) and English common law. Bahrain has a low crime rate. Shi'a activists fomented unrest sporadically from 1994 to 1997 and have engaged in protests with occasional low-level violence, relating the 2002 constitution, elections, unemployment, and the release of detainees. Sunni Islamist legislators support a greater role for shari'a law in daily life. Several small leftist and other groups are active. Women were granted the right to vote and stand in national elections in 2002. No women were elected to office in that year’s polls, but six were appointed to the Shura Council, which also includes representatives of the Kingdom’s indigenous Jewish and Christian communities. The country's first female cabinet minister was appointed in 2004 when Dr. Nada Haffadh became Minister of Health, while the quasi-governmental Supreme Council for Women trained woman candidates to take part in the 2006 general election. When Bahrain was elected to head the United Nations General Assembly in 2006 it appointed lawyer and women's rights activist Haya bint Rashid Al Khalifa as the President of the United Nations General Assembly, only the third woman in history to head the world body. Bahrain faces no threats from foreign nations, and is not involved in any international disputes. Relations with Iran were strained over Bahrain’s 1981 discovery of an Iranian-sponsored plot to stage a coup. Hostile relations with Qatar stemmed from a longstanding territorial dispute. A 2001 ruling by the International Court of Justice granted sovereignty over the Hawar Islands and Qit’at Jaradah to Bahrain and sovereignty over Zubarah (part of the Qatar Peninsula), Janan Island and Fasht ad Dibal to Qatar. 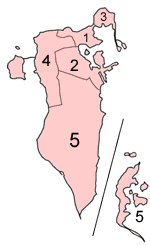 Bahrain's cities and towns include: Al Muharraq, Isa Town, Hamad Town, Jidhafs, Sitrah, Al Riffa, and Um Al Hassam. Bahrain Defense Forces comprise Ground Force (includes Air Defense), Naval Force, Air Force, and a National Guard. In 2006, 4.9 percent of GDP was spent on the military. Pearl diving was the main economic activity until cultured pearls were developed in early twentieth century, and when oil was discovered in 1930s. With its highly developed communication and transport facilities, Bahrain is home to numerous multinational firms with business in the Gulf. Petroleum production and refining account for over 60 percent of Bahrain's export receipts, over 70 percent of government revenues, and 11 percent of GDP (exclusive of allied industries), underpinning Bahrain's strong economic growth. Other substantial segments of Bahrain's economy are the financial and construction sectors. 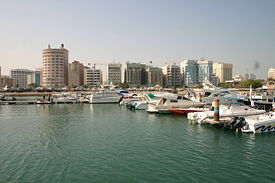 In the oil boom of the early 2000s, Bahrain had the fastest growing economy in the Arab world, the United Nations Economic and Social Commission for Western Asia found in January 2006. Bahrain also had the freest economy in the Middle East according to the 2006 Index of Economic Freedom published by the Heritage Foundation/Wall Street Journal, and is 25th freest overall in the world. But since economic conditions have fluctuated with the changing fortunes of oil since 1985, Bahrain has sought to diversify and privatize its economy to reduce the country's dependence on oil. As part of this effort, Bahrain and the U.S. in August 2006 implemented a Free Trade Agreement (FTA), the first FTA between the U.S. and a Gulf state. Unemployment, especially among the young, and the depletion of oil and underground water resources are long-term economic problems. Bahrain is a popular tourist destination with over two million tourists a year. Most of the visitors are from the Arab, Persian Gulf states but there is an increasing number of tourists from outside the region thanks to a growing awareness of the kingdom’s rich heritage and its higher profile resulting from the Bahrain Formula One race track. Imports totalled $9.036-billion in 2006. Import commodities included crude oil, machinery, and chemicals. Import partners included Saudi Arabia 36.5 percent, Japan 6.6 percent, Germany 6.4 percent, U.S. 5.4 percent, United Kingdom 5 percent, UAE 4.1 percent. Per capita GDP was $25,300 in 2006, ranked 35th on a list of 181 nations. In 2004, Bahrain signed the US-Bahrain Free Trade Agreement, which will reduce certain barriers to trade between the two nations. Demographics of Bahrain, Data of FAO, year 2005 ; Number of inhabitants in thousands. Most of the population of 698,585 people, in 2006, was concentrated in the two principal cities, Manama and Al Muharraq. The indigenous people—66 percent of the population—are from the Arabian Peninsula and Iran. The most numerous minorities are Europeans and South and East Asians. Medical care is free for both nationals and expatriates, and programs provide for the elderly and the disabled. There is a large hospital in the capital, there is an institute for the blind, and one for the physically handicapped. 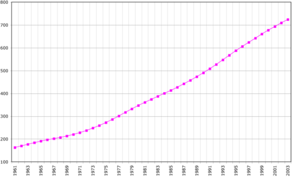 Life expectancy for the total population was 74.45 years in 2006. Two thirds of the population comprises Arabs, while the rest are immigrants and guest workers, largely from Iran, South Asia and Southeast Asia. Bahraini make up 62.4 percent, and non-Bahraini 37.6 percent, according to the 2001 census. Tribal groups include Arab tribes allied to the Al-Khalifa family, including the Utoob tribes, and Dawasir; Bahranis, who are indigenous Shia Arabs; the Howilla, who are mainly Sunni Persians with some claims of Arab ancestry; and Ajam ethnic Persian Shia. The non-tribal part of the population comprises Najdis, who are urban Sunni Arabs from Najd in central Arabia; Indians, who traded with Bahrain and settled before the age of oil (formerly known as the Hunood or Banyan; a tiny Jewish community; and a miscellaneous grouping. The official religion of Bahrain is Islam, which most of the population practices. However, an influx of immigrants and guest workers from non-Muslim countries, such as the India, the Philippines and Sri Lanka, has meant the overall percentage of Muslims has declined. According to the 2001 census, 80 percent was Muslim, 10 percent were Christian, and 10 percent practiced other Asian or Middle Eastern religions. Roman Catholic and Protestant churches, as well as a tiny indigenous Jewish community, exist in Bahrain. Though Shi'a Muslims make up more than two-thirds of the population, Sunni Islam is the prevailing belief of those in the government, military, and corporate sectors. There are no official figures for the proportion of Shia and Sunni among the Muslims of Bahrain, however unofficial sources, estimate it to be approximately 70 percent Shia and 30 per cent Sunni. Arabic is the official language. The two main dialects are Baharna Arabic, spoken by the indigenous Baharna Shia, in the capital and in the Shia villages, and Bahraini Arabic spoken by the indigenous Sunnis. Persian, Urdu/Hindi, English and Malayalam are spoken by sections of the population. Arranged marriage is common. Traditionally, girls were married at age 12 or 13. Now they tend to finish their education and have a job before marriage. The groom's family pays a sum of money to the bride, as a bride price. Weddings are big, involving up to 600 guests, a large meal, a religious ceremony, and a party in which the bride is decorated. The domestic unit traditionally comprised an extended family of parents, children, grandparents, and other relatives. A bride would live with the groom’s family. Now it is more common for young couples to set up their own homes. The birth of a child calls for a big celebration. Boys and girls are raised separately. Girls have more responsibility than boys, who have more freedom to play. While women were responsible for all domestic work, as more girls gained access to an education, and foreign influence modified traditional views, more women work outside of the home. Traditionally, Islamic women have a lower status than men and are considered weaker and needing protection. Quranic schools (Kuttab), aimed at teaching children and youth the Qur'an, were the only form of education in Bahrain at the beginning of the twentieth century. The year 1919 marked the beginning of modern public school system there. Al-Hidaya Al-Khalifia school for boys was opened in Muharraq. In 1926, second public school for boys opened in Manama, and in 1928, the first public school for girls opened in Muharraq. Education is free. Primary school lasts for six years, intermediate school for three years, and secondary school for another three years. Although not compulsory, primary and secondary attendance rates are high. The literacy rate, meaning percent of population age 15 and over who can read and write, was 89.1 percent in 2003; 91.9 percent among males and 85 percent among females. In 2004, the king introduced a new project that uses information communication technology to support education from kindergarten to year 12. This project is named King Hamad Schools of Future. The main objective is to link all schools within the kingdom with the internet and introduce the idea of "education everywhere, every time." Bahrain University offers standard undergraduate and graduate study, and the College of Health Sciences—operating under the direction of the Ministry of Health—trains physicians, nurses, pharmacists, and paramedics. The first private university was Ahlia University, situated in Manama. The University of London External has appointed MCG, one of the oldest private institutes in the country, as the regional representative office in Bahrain for distance learning programs. There is the Pakistan Urdu School, the Indian School Bahrain a leading school in sports and extracurricular activities, as well as some Bangladeshi and Sri Lankan schools. Greetings are lengthy and involve discussion about health and family. When someone enters the room, everyone stands. After shaking hands, one touches the heart to show affection. Men and women can shake hands. Visitors, including visits to shops or offices, are served coffee or tea. A number of well-to-do, well-educated people in this wealthy Gulf state live in Manama or Muharraq. As an indication of elevated status, wealthier people tend to wear their traditional long robes, or “thobes,” tailored in a Western style, with side and breast pockets, as well as collars and cuffs. In spite of its rapid economic development, Bahrain remains essentially Arab in its culture. Bahrain’s wealth is related to the creation of a unique, indigenous middle class. This has meant that Bahrain is more liberal than its neighbors. While Islam is the main religion, Bahrainis have been known for their tolerance, and alongside mosques can be found churches, a Hindu temple, a Sikh Gurudwara and a Jewish synagogue. The country is home to several communities that have faced persecution elsewhere. One facet of the new openness under King Hamad ibn Isa al-Khalifah is Bahrain's status as the most prolific book publisher in the Arab world, with 132 books published in 2005 for a population of 700,000. In comparison, the average for the entire Arab world is seven books published per one million people in 2005, according to the United Nations Development Programme. Bahrain in 2006 changed their weekend from Thursdays and Fridays to Fridays and Saturdays, in order to have a day of the weekend shared with the rest of the world. 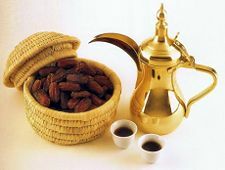 Gahwa served in Dalla and Finjan with dates. Bahrain's traditional food include fish, meat, rice, and dates. One of the most famous Bahraini dishes is machboos (مجبوس), which is made up of meat or fish served with rice. Another known food is muhammar (محمر), which is sweet rice served with dates or sugar. “Halwa” is another traditional sweet, a green, sticky dessert filled with spices and nuts. Bahrainis eat other Arabian food such as falafel, fried balls of chickpeas served in a bread, and shawarma, lamb or chicken carved from a rotating spit and wrapped in pita bread. Traditional snacks include samboosa and pastry. Important also is fresh fish—Hamour (grouper), typically served grilled, fried, or steamed; Safi (rabbit fish), Chanad (mackerel), and Sobaity (bream). Mostly, fish is eaten with rice, but a century of British rule has made fish and chips popular. Another delicacy is Qoozi, which is grilled lamb stuffed with rice, boiled eggs, onions and spices. The traditional flatbread called Khubz, is a large flatbread baked in a special oven. Numerous Khubz bakeries dot the country. Coffee, called Gahwa, is considered a part of the traditional welcome in Bahrain. It is usually poured into a coffee-pot, which is called dalla, and is served in a small cup called finjan. The traditional Sheesha (hookah), containing sweetened and often flavored tobacco, is served in most open-air coffee shops, where local men can be seen whiling away time enjoying the sheesha, and conversation. Muslim holidays are a time for large family meals. The end of the fast month of Ramadan is celebrated with feasts of traditional food, special sweets and pastries. The typical Bahraini woman dresses conservatively, usually the abaya, a long loose-fitting black gown, is worn. However, there is no formal dress code, and foreigners as well as local women are seen wearing modern outfits. Bahraini men usually wear the thobe and the traditional headdress which includes the keffiyeh, ghutra and Agal. 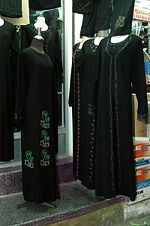 The thobe, sometimes called dishdasha, is a loose, long-sleeved, ankle-length garment. Summer thobes are white and made of cotton and winter thobes can be darker and made of wool. The ghutra is a square scarf, made of cotton or silk, folded in a triangle and worn over the keffiyeh. In Bahrain, it is usually red and white checked or all white. There is no significance placed on which kind the man wears. The keffiyeh is a white knitted skull cap worn under the ghutra. 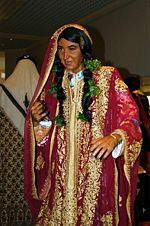 The agal is a thick, double, black cord that is worn on the top of the ghutra to hold it in place. The agal is a cord that is fastened around the keffiyeh to hold it in place. On some occasions, Bahrainis wear a bisht, which is a cloak made of wool, over the thobe. Unlike the thobe, the bisht is soft, and it is usually black, brown, or grey. Manama, parts of which stand on reclaimed land, has modern buildings and wide, tree-lined roads as well as an older section with a traditional souk, or marketplace. Muharraq, the oldest town that used to be the capital, has been modernized, but the old sections have traditional architecture—houses with tall gates, shuttered windows, and built around a central garden or courtyard. Some have wind towers, which is an old form of air-conditioning. The towers are open on four sides at the top to funnel passing breezes into the house. Traditional village houses, called “barastis,” were made from palm branches, but today are built from modern materials. The music of Bahrain is part of the pan-Gulf khaleeji folk traditions. It is also known (alongside Kuwait) for sawt music, a bluesy genre influenced by African, Indian and Persian music. Bahraini music is elaborate and repetitive. It is played on the oud (an ancestor of the lute) and the Rebaba (a one-stringed instrument). Sultan Hamid, Ali Bahar and Khalid al Shaikh (a singer and oud player) are among the most popular musicians from Bahrain. Khaleeji is a style of Persian Gulf-area folk music, played in Bahrain with polyrhythms. The style is strongly influenced by the music of Africa. The Bahraini male-only pearl diving tradition is known for the songs called Fidjeri, a musical repertoire performed traditionally by male pearl divers. It involves singing, clapping, drums and dances with earthen water jars. Black American performer Michael Jackson's relocation to the Kingdom has given an international spotlight to the lively local rap scene, with international DJs now appearing in the Kingdom, like DJ Outlaw. The Bahraini band Osiris has achieved some international renown since the 1980s with its style of progressive rock, most recently including elements of Bahraini folk music. There is a strong heavy metal and hard rock community—bands include hard rock outfit Dive, influential thrash metal band Motör Militia, and progressive rock and heavy metal band Avatar. 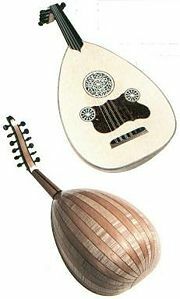 Front and rear views of an Oud. Modern music institutions in Bahrain include the Bahrain Music Institute, the Bahrain Orchestra and the Classical Institute of Music. Bahrain also has a folk dance tradition. The Ardha is a men's sword dance, which is accompanied by traditional drummers and a poet, who sings the lyrics. Football (soccer) is the most popular modern sport, while traditional pastimes such as falconry, horse riding, and gazelle and hare hunting are still practiced by wealthier Bahrainis. Horse and camel racing are popular public entertainments. Bahrain is the home of Formula One racing in the Middle East. It started hosting the Gulf Air Grand Prix in 2004, the first for an Arab country. This was followed by the Bahrain Grand Prix in 2005. Bahrain successfully hosted the opening Grand Prix of the 2006 season on March 12. Several weekly and daily papers are published in Arabic - Akhbar Al Khaleej, Al Ayam, Al Waqt to name a few. A small number of newspapers appear in English - Gulf Daily News, Bahrain Tribune. Most of the press is privately owned and is not subject to censorship as long as it refrains from criticizing the ruling family. The state television and radio stations broadcast most programs in Arabic, although there are channels in English and Hindi. ↑ 1.0 1.1 1.2 1.3 Bahrain. International Monetary Fund. Retrieved 2011-04-20. Al Muraikhi, Khalil M. 1991. Glimpses of Bahrain from its past. Bahrain: Printed at the Government Press, Ministry of Information. Bu Shahri, Ali Akbar. 1992. Dilmun Culture. 1992. Bahrain Countries and Their Cultures. This page was last modified on 6 May 2016, at 20:55.